Beat Slice til spontan sampling, slicing og chopping. Quantize funktion sikrer at Beat Effect og live samples automatisk holder beatet. Sync Master gør det muligt at indstille en master BPM og beat position direkte fra DJM-2000 nexus mixeren. Live sampler til at optage samples til remix, scratch, loop eller playback. Pioneer has raised the bar again with the release of theDJM-2000nexus: the powerful 4-channel professional mixer that combines advanced performance features and intuitive layout to empower unbridled creativity in the booth. or turntables and two laptops. The new Sync Master lets DJs set the master BPM for four CDJ players and control it from the mixer, while Beat Slice allows tracks to be sliced and arranged in real-time. These new features combine with favourites such as Quantized Beat Effects, Live Sampler and studio-quality Instant FX to deliver truly powerful remixing possibilities. 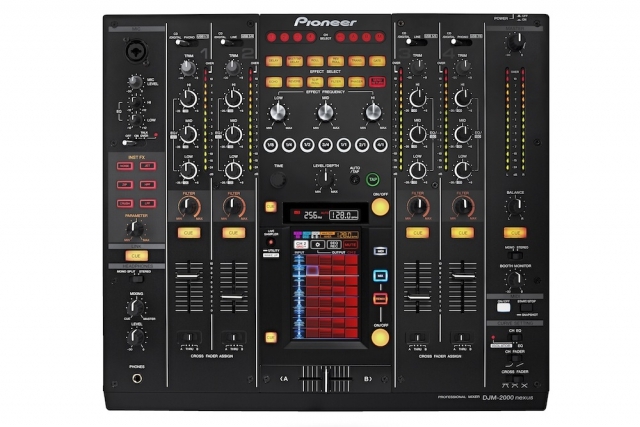 The new flagship Pioneer DJM 2000 NXS mixer retains its predecessor?s popular 5.8-inch LCD multi-touch screen, to offer a multitude of ways to manipulate the music. In addition to being the nerve centre for features such as Sync Master and Live Sampler, DJs can use the touch panel to control three innovative performance modes ? Frequency Mix, an enhanced Side Chaining Remix mode, and MIDI mode ? for even greater originality. The professional grade DJM 2000 nexus is designed with the club environment in mind. A newly designed Peak Limiter eliminates distortion and clipping, even at high volumes, while high performance channel faders provide smooth motion and a long life. Improving on the high quality audio of the DJM-2000, the DJM-2000nexus boasts a lower jitter DAC clock on the Master Out, and the best quality A/D converter seen in the DJM series so far. Plus, chrome plating and white LED illumination mirrors the design of the CDJ-2000nexus, for a professional set-up that looks as good as it sounds. ProDJ Link set-up enables LAN connection to up to four CDJ 2000 or turntables and two laptops at the same time. So rekordbox music files stored on USB/SD cards can be shared among multiple players, and DJs can easily switch sets. NEW! Beat Slice: spontaneously sample, slice and chop tracks to create original arrangements ? while the unit?s Quantize function analyses rekordbox track information on connected CDJs to automatically snap new creations to the beat. NEW! Sync Master: set the desired master BPM and beat position on the mixer and sync to up to four CDJs, eliminating the need to set individually on every channel. Quantized Beat Effects: trigger the DJM-2000nexus?s popular Beat Effects with confidence. The unit?s Quantize function uses ProDJ link to retrieve rekordbox BPM and beat grid information from connected CDJs or laptops, to automatically sync all Beat Effects in perfect time with the mix. 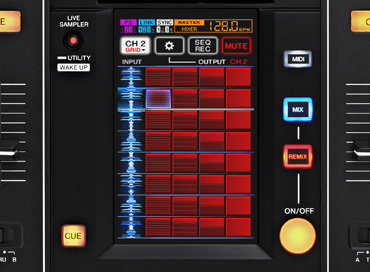 Live sampler: take samples on the fly ? from a track or the MIC input ? and load onto a CDJ for instant remixing, scratching, looping or playback. Pro-DJs can max the volume without worrying about distortion or clipping, as the newly designed peak limiter kicks in as soon as the input is pushed too high. Plus, all four channels are equipped with a Peak Level Meter for checking input levels at a glance. 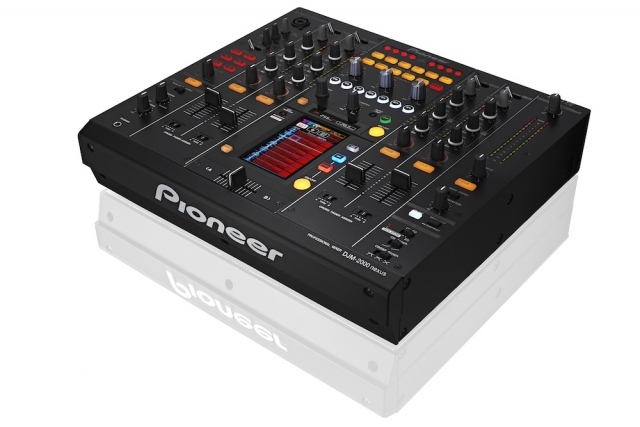 The Pioneer DJM-2000nexus adopts fader technology and fader caps designed for a long life in the tough club environment. Two metal runners make fader operation smooth and durable, and the mechanism is positioned away from the faceplate opening and out of the way of spillages, dust and obstructions. The DJM-2000nexus delivers superb sound quality based on the high quality audio design of its predecessor. The onboard USB soundcard can simultaneously input and output all audio signals with no degradation of sound quality. The DAC on the Master Out has been upgraded to a lower-jitter crystal oscillator. The booth monitor output and the 32-bit A/D converter are the highest quality yet for the DJM mixer range, delivering superior sound quality on all outputs, while the 32-bit DSP suppresses digital noise. Frequency Mix mode: seven-band cross fader so DJs can choose which frequencies are in the mix. 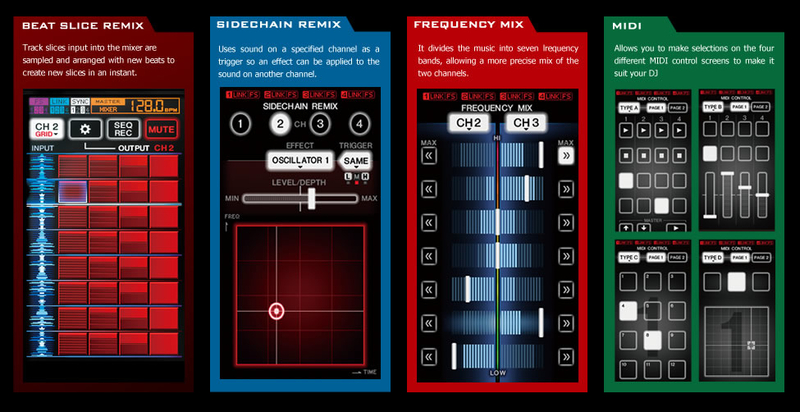 Enhanced Side Chain Remix mode: the DJM-2000nexus borrows technology from the groundbreaking RMX-1000 remix station, to deliver louder side chain oscillators and multiple effect chaining. MIDI mode: to control PCs or laptops running almost every DJ software on the market. High quality FX ? High Pass Filter, Low Pass Filter, Jet, Zip, Crush and the massively popular Noise ? are instantly accessible via dedicated buttons. There?s a Low Pass and High Pass Filter knob for each channel, while each effect can be fine-tuned using the large rotary parameter dial. The DJM-2000 nexus has received a few cosmetic enhancements to bring it in line with the stunning CDJ-2000 nexus players. Chrome plating has been applied to the dials and white LED illuminates the Beat Effects for an all-round stylish design.